to some other leaky London roof. Apart from ‘geometry of slate’, the tone is conversational, but even so, because this is a collection that incorporates more than a fair amount of science, such locutions soon become part of the conversation. The tilers entertain themselves: ‘One sings ‘Blue Suede Shoes’. / I admire their footwork’. There are brilliant little poetic coups like this to be found throughout this serious book. Here ‘a level nose for doom’ is something shared by all those on the ground who fear that were they on the roof they would fall off. For the tilers that ‘is never going to happen’. In ‘Meteorite’, the ‘falling star’ is news: ‘without doubt / suddenly a hot rock’, something ‘spectacular / with lots to offer a full stop’. And, we observe, lots to offer a poem without punctuation. “The Man Who Loves Useful Sports” (love being a form of attraction, and therefore of gravity) is interesting for all manner of reasons. First, it’s written in the third person though clearly the protagonist is as much Sant as any ‘I’ to be found elsewhere. Second, he’s no team player (he calls stumps, or the wicket they form part of, ‘wickets’ while telling us he can’t see the point of wasting afternoons on cricket), and I’d say that, like Mark Twain, he’s just plain wrong if he supposes golf to be ‘a good walk ruined’. To make matters worse, the sports he does care for are shooting and yachting, so he is understandably quick to defend himself against the obvious objections (killing, and wealth, and social class). He does not approve of the ‘strenuous butterfly stroke’ (even of watching it) but likes the breast-stroke because it allows him to keep his head above water so that he may compose ‘an agile, roving, maritime ode’. All of this is good fun to set against any earnestness he fears may be elsewhere in the collection. But we know he still means what he says! His discomfort with sports is evident, too, in “The Multicoloured Ball in Motion” where he uses the intransitive form of the verb ‘kick’, which is indicative here only of someone who doesn’t play football. But this is all part of the appeal. I like the way the speaker simply assumes that ‘those / in cars on the promenade’ are watching him and his grandson kick a ball about on the beach, and the way he enlists the help of the prevailing weather to engage with notions of gravity in a poem where the ball becomes an ‘orb’ that resembles ‘a floating planet’ or a bobbing buoy without ever being anything other than ‘a common ball’. This opening section’s sub-title poem, “Gravitational Pull”, is an instructive guide to Sant’s way with poems. 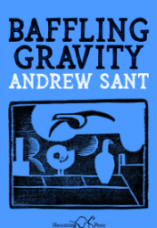 Its first line (‘Gravity always proves itself’) is followed by obvious examples and an acknowledgement that possible hypothetical quantums of gravitational energy may be present that are ‘blind / to Einstein’s theory, defiant’. When we then read ‘Balls of unequal mass // it’s reported Galileo dropped / from the Tower of Pisa, a high // Renaissance demonstration, peaked / in a dead-heat’, we might not be being told anything we didn’t already know, but it’s marvellous poetry all the same. Can we let ‘peaked / in a dead-heat’ go by without a nod of acknowledgement? The same might be said for ‘when gravity makes sediment impressive’ and for any number of other examples throughout the collection. The point here is that, just as a recovered cliché restores life to what was dead, so too do lists and thematically-linked poems in the hands of a poet like Sant remind us of what can be done with them, especially in an age when they have become, to their detriment, creative-workshop fodder. The second section’s “Mood Piece” includes the phrase that gives the collection its title and provides another example of how the ordinary and quotidian can be transformed. Here it is a recently washed shirt that hangs on a clothes-line displaying when wet ‘forgotten weather’ and turning when dry ‘gymnastic in the welcome breeze’. In doing so, of course, it is baffling gravity. Look, ‘no hands’. Baffling can mean both incomprehension and lessening, so it is unsurprising to find poems exhibiting one or other or both of these attributes. “Source”, for example, takes in the history of the Yarra River in Sant’s Melbourne. Its first section concludes (where the river narrows) at Dights Falls: ‘All the global water that’s flowed since Dight / built his mill goes smoothly over his weir. // It was never intended to be, but is, soothing to hear’. It is the very kind of accident poetry thrives on; baffling and baffling. In Part 3 the speaker discovers, as Hardy’s reddleman does the figure on the barrow at the beginning of The Return of the Native, a saxophonist high above the river, ‘the source of his music restorative, liquid, breezy as cliffs’. ‘Shirtless, he shone’, we’re told, as if we’d seen what he’d shed earlier in “Mood Piece”. she gushed too much blood to live. when the sound was turned up. The matter-of-factness of this poetic reportage is comparable to that of Robert Frost’s ‘Out, Out –‘. It is followed by the differently devastating “A Suicide Note”, in which the speaker returns after fifty intervening years to read the Proceedings of Inquest concerning his mother’s death when his voice had not yet broken and her parting note. Gravity, indeed.